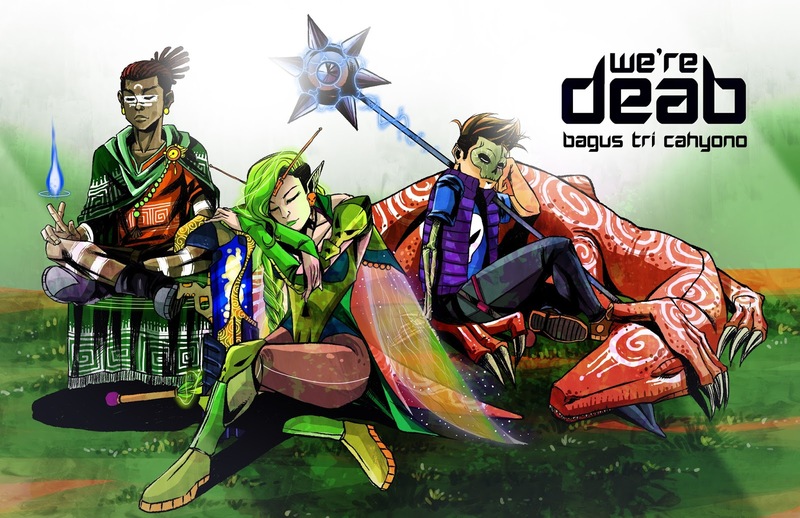 WE'RE DEAD is a fantasy, sci-fi, and kinda horror adventure that will be updated every Wednesday. The story is about the 4 grade boy named Marlon and his pals, trying to save the day by being dead. Yes, it will take a place out there in after-death realm called Baka. You will see magic, fantastic beast, magical creature, dinosaur, spaceship and everything awesome mixed together to bring the most joy. Well, as i mentioned before, this webcomic will be updated every Wednesday. But too bad i can't update it in a large amount of pages since i have different mandatory job that take almost a whole time i have. The update is about 2 or 3 pages a week and i hope for more of course. It's all depend on the time i have left. If my mandatory job takes over time, than it will be less pages for update. So sad. That's why i build this Patreon. To ask for your help to make this project as my full-time job. Once the income from this account is the same as my current income from my mandatory job, i will leave it and make this project as my full-time job. So the update will be so much satisfying. So, help me, please. Oh and when the whole chapter is complete (it will contain about 22 pages), i will make Kickstarter campaign so you can experience it as printed book. It's better to hold it than just watch it through the monitor, right? Because you will get a bunch of great stuff. You read it a day before it's launched in website, original script, thumbnails, sketch, hd pages, videos, and more!! Isn't that cool! But the most important thing is, that, you help this lil guy achieving his big dream as independent comic artist. And thank you so much for that. Thank you so much for helping me keeping update WE'RE DEAD. You will get digital thanks card every month! - Full resolution pages of tomorrow comic's today. It feels good you know, knowing the story a day before your friends do! Watermark applied. If you want to get rid of it, then next reward will be great. - PSDs of the page, brushes, script of those pages, thumbnails, and sketch, it's great isn't it? And you can remove the watermark too! - PDF of single issue once it complete the next 5-6 weeks. - Real time video process and poll for the next issue. - Q and A. Ask me everything and i will answer it!! - Your name will be in the special thanks page in the web and in the page of the print once the single issue come out! - I will give you printable pin up drawing, with you as the main character, among the character of WE'RE DEAD!! Or anything you ask me. - I will use your name for the cameo in the comic. Every Patrons will get 3 A3 sized special edition wallpaper! !